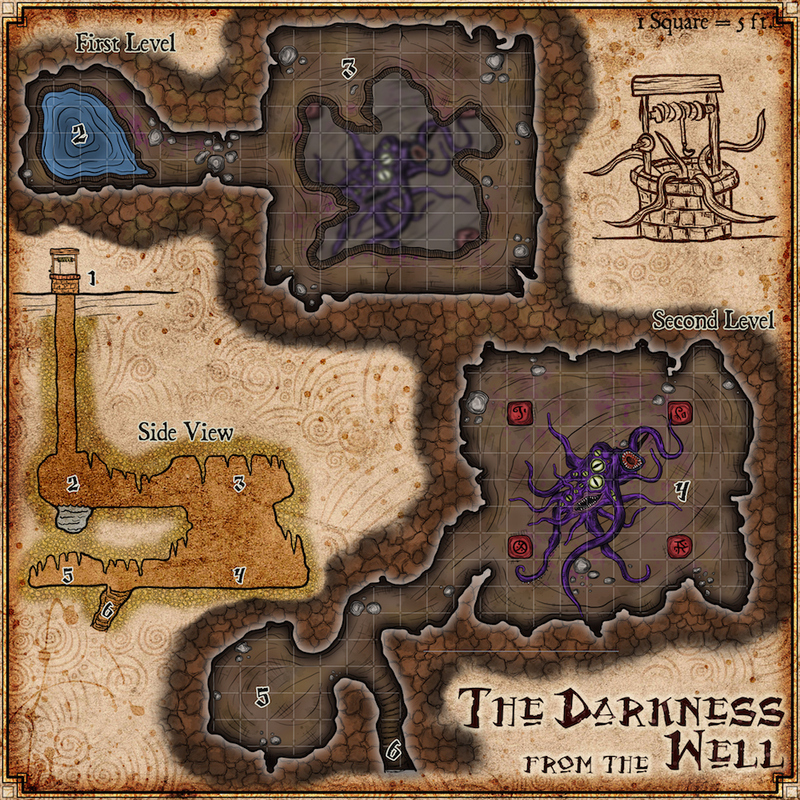 This resource features the general description of an unexplored cave under the town’s water well. It includes adventure ideas that are appropriate for mid-level (Levels 6 to10) adventur­ing parties. It is optimized for four level 8 characters. Challenge Rating (CR) is calculated using a party of four as the model. The DM is free to change or modify any or all the information found here. NPC names and settlement names are the first the DM should consider changing to accommodate any homebrew world lore. 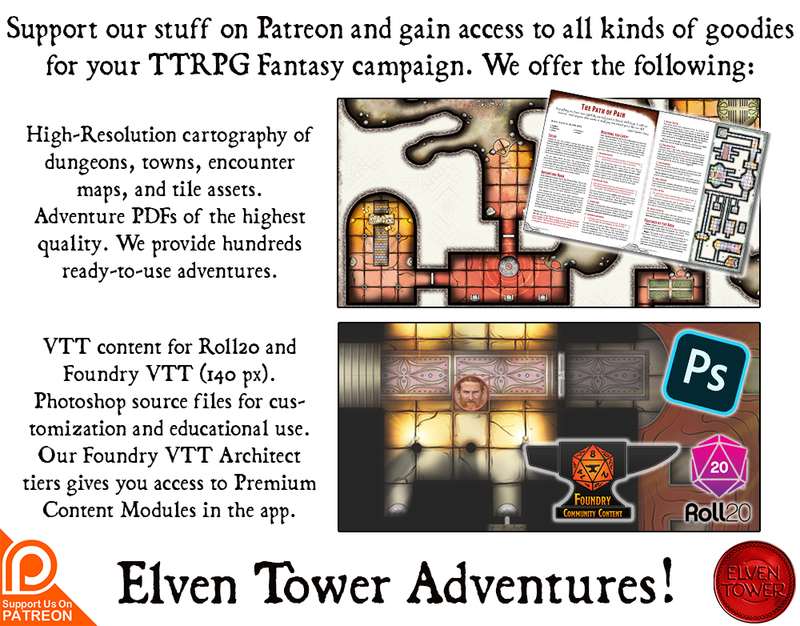 To modify the challenge rating of the adventure, the DM must first con­sider the power level of the party. Considering the PCs’ individual levels and the number of players is crucial to presenting a good challenge. Not all parties are the same, different playing styles and command of the system in the party can increase or decrease their effectiveness in en­counters. The DM may adjust the encounters slightly by adding or subtracting monsters. Alternatively, controlling monsters with more intelligence and strategy is often the easiest way to raise the difficulty of an encounter. Life in Reefer Town was never easy but at least people knew that if they worked hard they would want for anything. The town was large enough that a visitor might mistake the place for an actual city because of its size. But Reefer Town was just a name for a really large community of farmers. Their population is as large as a city’s, but their geographical extension makes it harder for the community to start falling into the standard tropes expected in any city. People live far from each other except for the town’s square. The square is an assortment of several buildings and a few houses of people who are not farmers but rather merchants and a few shopkeepers. The farmer community does not have a wall either because it would be prohibitive to build one that encompassed all of the farms. It would cost a fortune, and the town does not produce that much value for the province. There are some ideas to build a palisade that surrounds the town square but nothing conclusive. The land is fertile and produce is big and healthy. The farmers use the river north of Reefer Town for irrigation. There is a water well about fifty feet from the square where people get all the water they need for personal consumption. The well goes down almost one-hundred feet to a natural spring. The water well has not dried out after many years. Some people think it is not a spring but rather an underground stream. Whatever the case, the water well is important to the settlers of Reefer Town. Things took a turn for the worse over the past few months. It all started when a pair of cows went missing overnight in a farm next to the town’s square. The cattle farmer claimed someone had stolen them but the militia patrol had nothing to report. They had not seen anyone breaking into his farm or the town square. A few days later, a goat and two chickens went missing too. The only difference is that whoever did it left evidence this time. There was a splatter of purple-tinted goo on the ground, next to the coup where the farm animals where grazing. The farmers did not know what to make of this. After weeks and a few more instances of cattle disappearances, the town’s square found itself was crowded. Almost four-hundred people where present for the autumn Red Leaf Festival. A celebration they held every year on the evening of the equinox. There was food, fair games, three customary dances, and a horse race whose track circled around several farms. It was then, in front of most townsfolk, that something out of the ordinary happened. A pig was grazing in its coup when something emerged from the water well. The thing was very long, like a snake with no head. Long enough to twist away from the well and reach the scared pig, grab it, constrict it, and then pull it back down the well. The tentacle’s surface appeared rough, not like the scaly texture of snakes. It also had a humid nature to it. It all happened so fast that the townsfolk did not react for a few seconds. The terror that ensued right after was nothing to fault them for. Most of them had never experienced anything beyond what’s expected in a farm. That was three years ago. People lived in terror for weeks, then months. But when months became years, the monster from the well became a part of their lives. The people do not fear it as much these days, but they respect it. No one knows what the creature is yet. The only parts of it they have seen are the tentacles that emerge from the well every few days looking for food. The farmers found out that the creature does not only eat cattle, it can also take crates of produce from the farms. It also takes any residue the farms produce, like animal remains, rotten produce, and any other thing from organic origin. The townsfolk abandoned the two buildings closest to the well for obvious reasons. People also teach their children not to ever approach the well. Despite all of this, the townsfolk continued using the well for water. For one thing, the water was good. Secondly, the monster did not object to it. As strange as it sounds, the townsfolk developed a “relationship” with the creature. It was a great way to get rid of residue. It came to a point where, if a farmer was drawing water from the well and a tentacle appeared, the farmer fell confident enough to slap the tentacle with a farm implement to make it go back for a few minutes. Things are worse these days. For a few weeks, the few people that interact more with the monster have noticed that is has grown far hungrier than before. Now it comes daily looking for its dose of farm food. It does not respond to slapping as it used to before. Instead, it resists the attacks and sometimes attacks the person by smashing him to the ground. Now the townsfolk are looking for an alternative on how to deal with the current situation. They have not been able to draw water for a few days but the worst thing is that a person is missing now. Nobody saw it happen but people are claiming that the man was taken by the creature and now no one dares to be within fifty feet of the well. The monster down the well is an aberrant creature from the Far Realm. Its tentacled amorphous body is nothing but a mockery of biology and physiology in the material plane. The monster’s body cannot be measured or described in any meaningful way, it is a shape-changing biomass with a changing number of tentacles or pseudopods. It features nine eyes of different sizes and shapes that meander around its outer surface. The eyes have narrow slits for pupils. The aberration has no place in this world. There is also no way in which it could reach the material plane without help. The person responsible for this is a drow elf named Gazerin (Archmage, MM, page 342). Gazerin is a magic summoner who was interested in summoning creatures from other universes beyond belief. Gazerin used his magic to commune with entities from the Far Realm so that he could summon one of them. His plan backfired when the powerful beings from the realm of madness used his own magic to insert motives, thoughts, memories, and experiences in his mind. Gazerin is not what he was a few years ago. He is, for all intents and purposes, a cultist mage in the service of the Far Realm. Gazerin was instructed to craft four invocation stones underground. He used dark blood magic and the invocation stones to open a rift in the fabric of the universe and bring forth an aberrant creature from it. Gazerin cares for the creature all the time. The monster crawls up the cave and reaches the water-well bottom. From there it can reach up with its tentacles and find food in Reefer Town. The creature’s motives and intelligence are impossible to fathom. But for whatever reason, it has decided to be more demanding of the people in Reefer Town. It even started attacking them and kidnapped a person. The monster did not eat the farmer but played a spell on it that made him a thrall, just like Gazerin is. These are the general features of the cave under the town’s water well. The cave complex is located one-hundred feet below the well. Terrain. The floor is rough untreated stone with a few patches of soft soil. Some parts are stained with purple-tinted splatters. This is the creature’s slime. Light. The only part of the cave with dim-light is Area 2. A dim ray of light comes from the well’s shaft. The rest of the cave is in complete darkness. Smells and Sounds. There is a prevailing putrid stench that comes from the splattered purple goo all over the cave.